So after some discussion, I was asked what I thought should be done about it. I believe my answer to them still holds today as a way to address both Hamas and the rights of the people in Gaza. 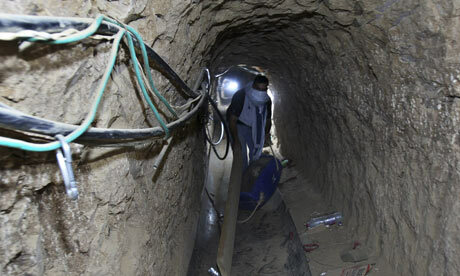 The land crossings in and out of Gaza should be reopened. Before the tightening of restrictions in 2007, attacks against Israel by shooters and suicide bombers and the like were, with very few exceptions, originating in the West Bank. This was not due to Hamas security efforts, to be sure, nor with some resolve from Gazan militants not to launch attacks against Israelis. The rocket fire, which was going on for years even then, was proof of that. No, the reason was that Gaza had been walled off for years and entrance and egress from the Strip was narrowly confined to the crossings. Goods and people traveled through those crossings, a laborious affair to be sure, but people managed. the US’ ability to fund it). The siege regime actually increases the flow of weaponry into Gaza. It opens up a competing route which Israel cannot inspect and Egypt can’t afford to fully close under current conditions. Going back to the status quo ante before Israel raised the blockade allows for better land monitoring. We need also to understand that Israel’s purpose in initiating the siege had little to do with security. As Dov Weisglass, Ariel Sharon’s former right hand man, said, the point was to “put the Palestinians on a diet.” That is, the idea was to collectively punish the civilian population of Gaza so that they would overthrow the Hamas government. Well, that hasn’t worked out. So perhaps it’s time to instigate a policy whose primary purpose is to protect Israeli civilians and harm the civilian population of Gaza as little as possible. Doing so would have the added benefit of opening a path toward reunifying the Palestinian body politic. It doesn’t actually accomplish that—Hamas will still be required to meet the Quartet’s conditions (which themselves may need some modification in order to sensibly be applicable, but that’s another article), and new elections would need to be held. But until Gaza and the West Bank are reunited, until Hamas can be co-opted into the political process—both in terms of its acceptance of the necessary conditions and acceptance by Israel and the West that it is no longer possible to have a Palestinian body politic without them—there is no chance for a two-state solution. The land crossings can be re-opened, the Egyptian underground wall can be built and Gazan imports and exports can be returned to previous levels, all the while doing this through international aid organizations that already exist and already stand apart from Hamas. This enhances Israeli security and allows the Gazan people to live. The naval blockade is a somewhat different kettle of fish. Monitoring that traffic is more difficult but not impossible. Israel refuses to lift the blockade, and the PA and most of the Arab League countries also support that. The reason is that, unlike the land crossings, lifting the blockade makes smuggling via that route much easier. Still, there are some options here. Maintaining the blockade but allowing certain goods through, on ships that obtain advance clearance to dock and which can be inspected by international forces (thus removing the risk of a repeat of the flotilla fiasco) is something that can be arranged. But this is likely one aspect of the siege that will need to remain in a much less modified form, and Israeli ships are going to continue to patrol for unauthorized vessels. These are all points I made to the State Department a year ago. I believe they are just as viable today and far more necessary. The fact that similar ideas seem finally to be under discussion among the Israelis, Americans, Palestinians and Egyptians bolsters the logic. It should never have gotten this far. These suggestions or something similar are not that hard to come to. All that was ever required was a determination to oppose Hamas with a minimum of damage to the civilians of Gaza. Instead, Israel pursued a blockade that barred coffee, cinnamon, sugar, ketchup, mayonnaise, cigarettes, cleansers and other foods and consumer products for no good reason. about freeing Gilad Shalit. His captivity should have ended long ago, but all sides want to ensure that the resolution of his captivity is not a victory for the other. So, perhaps it’s time for all parties to take a more pragmatic approach. Simply lifting the siege completely isn’t an option. Despite the rhetoric, there is no support on the diplomatic level for such a move in the US, Israel, Europe or most of the Arab world. No one this side of Iran wants to see Hamas established as a legitimate sovereign. At this point, neither the Hamas government in Gaza nor the PA in the West Bank reflects the 2006 vote, but the PA, for better or worse, enjoys international approval while Hamas does not. That isn’t about to change and I, for one, would not want it to. But restrictions on Gaza that address Israel’s security concerns, route goods as much as possible through the UN and international humanitarian NGOs that are already operating in Gaza and strive for the minimum impact possible on the civilian population can work. And without Israel risking more incidents like the flotilla fiasco. From there, the PA must establish contact and serious discussions with Hamas, and the US must encourage unity. This can also include carrots for Hamas to incentivize controlling not only their own rocket fire, but also that of other groups, a control Hamas has demonstrated it can exercise to a good degree. The groups it can’t control are generally as much a threat to Hamas as anyone, so they will also have incentive to stop them. None of this, obviously, requires Israel to drop its guard regarding Gaza. And if there is some risk that some of these things, if they go wrong, may strengthen Hamas, that is nothing compared to how much Israel’s, as well as the US’ and Egypt’s, current policies have done just that, and will continue to unless those policies are changed. It’s time for a real security regime that also accounts for human rights. It’s time to replace harsh measures on civilians for political ends with a program designed to undermine Hamas’ ability to strengthen itself. It’s time, in short, to abandon the failed policies inspired by neoconservative thinking and adopt intelligent and ethical tactics. Israel can afford to do no less. This entry was posted on June 13, 2010 at 9:10 pm and is filed under Uncategorized. You can follow any responses to this entry through the RSS 2.0 feed. You can leave a response, or trackback from your own site.